I'm back with another preview of some upcoming Bohemian Polish shades. I'm hoping to have the Polish Con LE's ready to share with you later today. In the meantime, I have today's #31dc2017 half moon mani look. These are possibly the most imperfect, perfect half moons you will ever see for a half moon mani. They are imperfect because I shockingly do not own half moon vinyls. That said, I'm so delighted with the color combo that I don't mind the freehand imperfections. If you enjoyed this post you might like 31dc2017 - Delicate Damask feat. 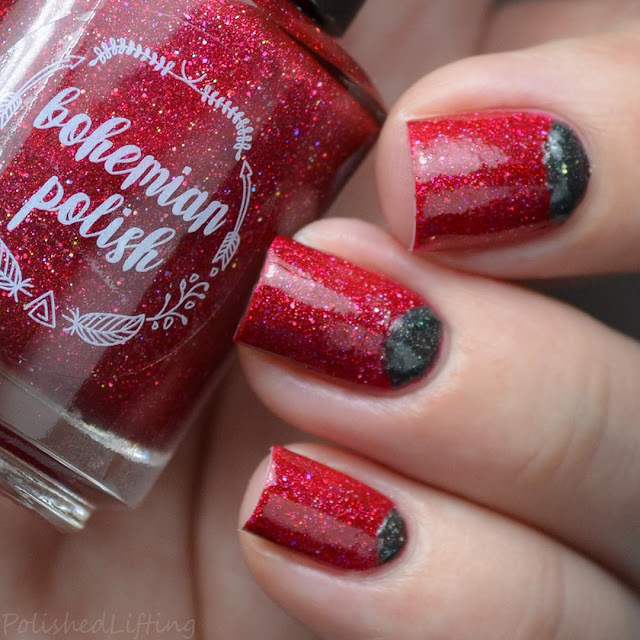 Bohemian Polish Comin' Home Again and 31dc2017 - Bat Glitter feat. Bohemian Polish Pulaski At Night.